Welcome to all your new friends stopping by from various blog hops today! Happy Friday!!! I am spending the day today with my family at the Happiest Place on Earth -- yes, Disneyland! You can take a look at the blog hops I'm joining today, here. Don't forget to enter in my Munchie Mugs giveaway here. If you have a toddler or a soon-to-be toddler in your house (or even one that comes to visit) you won't want to miss this!! Wednesday night at a church meeting I participated in a class to learn the fine art of bread making. 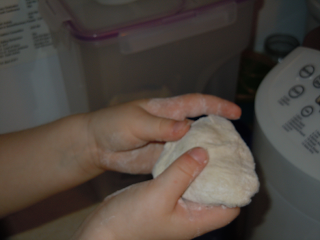 The teacher doesn't believe in modern technology and insisted that bread needed to be made by hand (or in her case a Cuisinart). As a mom of two little rugrats, I don't always find the old-fashioned-way to be the most efficient! Don't get me wrong, I love doing things the old way... sometimes... but only when I have the time. Most of the recipes I got on Wednesday contain milk and gobs of butter... both of which would send my son to the emergency room. So, I pulled out the little recipe book that came with my bread machine and found a recipe that was dairy free. **make sure if you use your bread maker that you put these ingredients in your machine in that order!!! 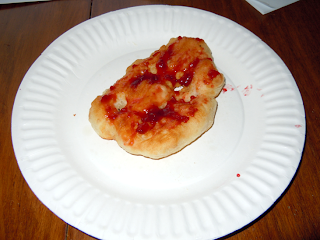 I set my machine on the dough cycle, and about 2 hrs later this is what I had. 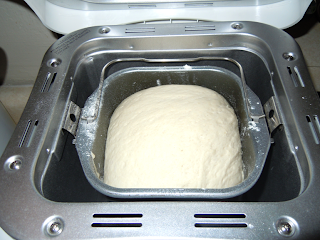 Now, I could have mixed it in a kitchen-aid (but I don't have counter space in my kitchen for that and the bread maker) or by hand and it would have gone a lot faster... but this way I was able to keep my kitchen - and kids - from being covered in flour, and I got other things done. I am a HUGE FAN of multi-tasking!!! Then I enlisted the help of my 3 year-old!! She loved helping. She got out her little apron and the "big step stool" (as she calls it) and got to work. Anything I can do to spend time with my kids and be productive is just icing on the cake! Grab a little bowl and put some flour in it. Tear off a small orange sized piece of dough, cover it in flour to keep from sticking to your hands, roll it in a ball, then stretch that ball - kinda like pizza dough. 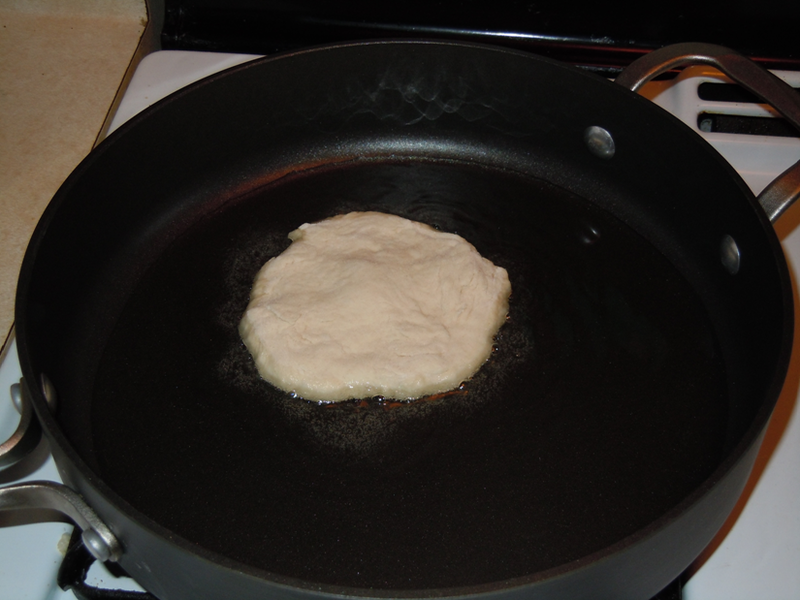 Meanwhile, heat up some oil in a skillet on med-low. 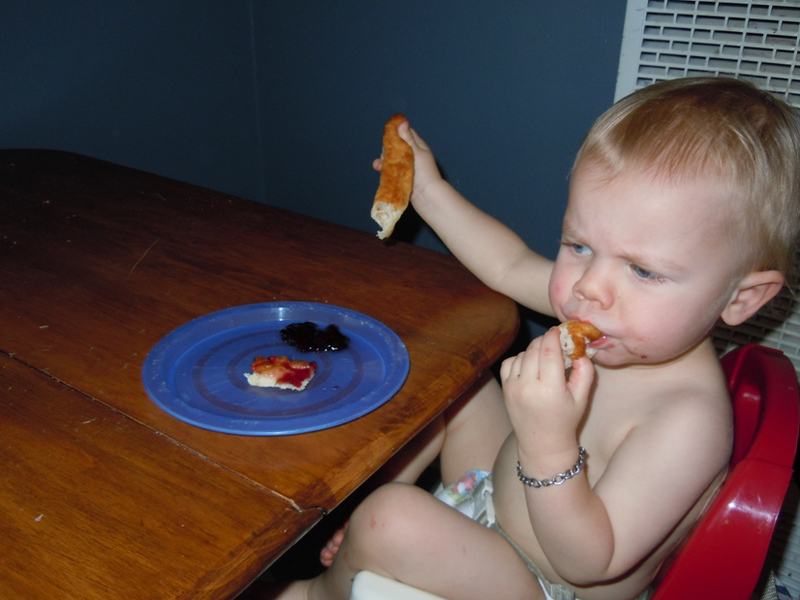 Once you make your little pizza, carefully drop it in the hot oil. Be careful so it doesn't splash... made that mistake myself! Keep making and adding more little pizzas. It only takes about a minute or so to turn golden brown. Flip it over and cook the other side. While those are cooking, grab a paper plate (or whatever you want to use -- doesn't really matter, I just had some paper plates on hand) and put a paper towel on top. 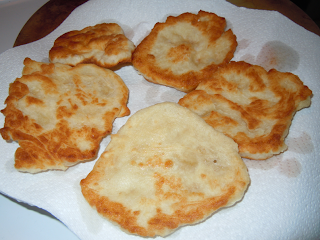 Take out your beautiful fried bread and layer them on the paper towel. Top with another paper towel. I decided to try something a little fun and dug out my Mickey Mouse cookie cutter. 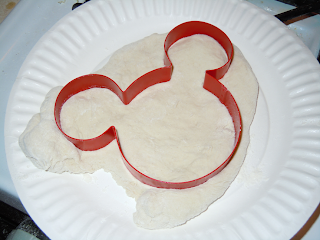 After flattening the bread dough I cut out the Mickey shape and fried it. It was super cute!! Next time I might make them all Mickey's!!! My kids loved it! 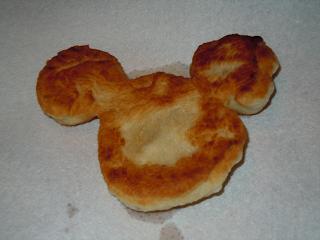 The finished, fried Mickey! Cute, right? Once they are done you can top them with just about anything!! We chose jam, jelly, and cheese. At my meeting I tried it with cream cheese and jam... delicious!!! I bet peanut butter would be great too!! The possibilities are endless!!! 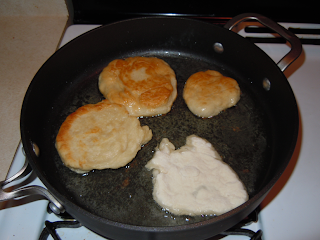 I also tried rolling some dough into a little snake and frying it -- thinking that my son might like to dip his bread. He has taken lately to being a dip-a-holic! Everything gets dipped -- whether it should, or not! We put some cheddar cheese on Mickey. It was super tasty!! 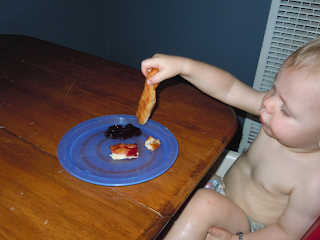 My daughter gobbled most of it up, then asked to try mine and gave me a piece of hers to trade for it. So cute! Now, I know that fried foods aren't all that great for you, but every once in a while it's a nice treat! You can always use frying oils that are better for you, and you can use probably just about any bread recipe. So, if you are looking to cute the fat, try a whole wheat bread dough, or one with oats and grains in it! Let me know if you try something new, I'd love to know how it turned out!!!! Hiya! Newest follower from Fun Follow Friday! Yeah great job posting your first recipe!!! Come link up your recipe in my recipe tab!! Great way to get more hits on your blog and hopefully new followers!!! This looks so delicious that I plan to make it for a weekend treat for my family. I'm a new follower from the friday follows:) I look forward to reading your posts and browsing your Etsy shop! hiya, I love your blog! 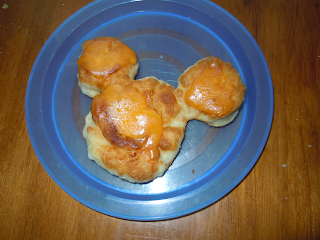 Cute Micky bread...I should think of something creative to eat for my 19month old daughter too. OOh, look seriously yummy. Since I have a bread machine... :o). I'm a new follower from follow fridays. That looks so yummy and your blog is so cute! Hi, I am following you from FFF! I'm your latest follower - found you on New Friends Friday - yummy bread recipe! Hope you all have a great time in Disneyland! And join us for Flashback Friday while you're there! HELP ME GET TO 200 FOLLOWERS!! !